This is a Dark Angels Deathwing shoulder pad. The Deathwing is the First Company of the Dark Angels, and consists of the most experienced veterans of the Chapter. 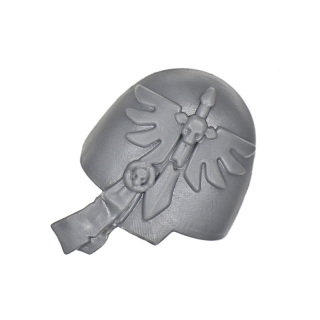 Their company symbol is a broken sword, and the armor of a Deathwing Space Marine is colored bone-white. This color scheme is maintained in memory of the fallen, because during the liberation of their homeworld many brothers were killed. In battle, the company fights exclusively in Terminator armor, what distinguishes the Deathwing of other First Companies. In deviation to Codex Astartes loyal orders, where the squads wear uniform weaponry, the members of the Deathwing fight their operations usually with mixed equipment.